“A truly comprehensive and thought provoking training course. Not only was the training structured well, but the trainer was inspirational and motivational. I came away from the course full of enthusiasm and could not wait to put into practise what I had learnt." 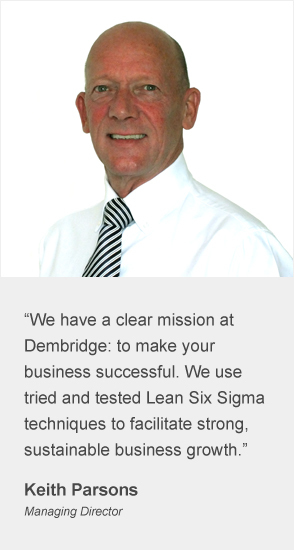 Dembridge – making your business successful through proven Lean Six Sigma deployment. We have a clear mission at Dembridge: to make your business successful. We use tried and tested Lean Six Sigma techniques to facilitate strong, sustainable business growth. With a wealth of experience, Dembridge has successfully delivered numerous training and coaching sessions and business project work. Our tenacious approach in delivering beyond our clients and students’ expectations has brought us great acclaim. We do not profess to be a corporate enterprise, rather a business that gets close to our clients and really understand their business. Dembridge prides itself on delivering quality – quality of training and quality in project delivery. We achieve this through close collaboration with our customers. Execution of exacting standards is central to our business objectives. Sharing of our knowledge is a pleasure and we believe in educating rather than teaching. None of the above would have been possible without effective leadership, engagement and communication throughout the life of the project. We place great emphasis on these three fundamental enablers. As part of our process we always want to know that we delivered on our promises to our customers and we seek feedback after each and every event. We are proud that our testimonials reflect these promises. But don’t take our word for it. Call Dembridge now to get a free consultation or to discuss more about our great value training courses. The combination of our expert training and project management can be summed up by our strap line – Learn, improve, sustain. It is very easy to ‘train’ people, but allowing them to learn is very much different. That is why we place a great deal of time on ensuring that our training is geared towards helping the students to learn. The material that we produce along with the interactive nature of our courses helps to achieve this aim. This training – or rather learning – is of no use if the students cannot deploy the methodology that brings about improvement. The training encompasses practical exercises and case studies that allow the students to understand how this learning can be applied back in the workplace. Now that the training is complete, the improvements have been identified and the solutions implemented, the necessity for embedding these improvements is critical. Sustainability of the improvements will enable the achievement of continued business benefits.